Clinton, Michigan - Organic Eden Black Bean & Quinoa Chili, Refried Pinto Beans, and Garbanzo Beans (chickpeas) were Men's Health magazine selected for November's annual feature "The 125 Best Foods for Men". 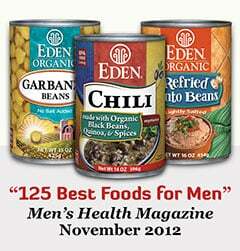 This is the seventh time Eden foods have been similarly honored by Men's Health, and we are grateful for their wisdom in discerning. Eden Black Bean & Quinoa Chili is honored as the "Best Chili". Eden Refried Pinto Beans were chosen as the "Best Refried Beans", and Eden Garbanzo Beans as the "Best Canned Beans." All three are Eden Organic, and in BPA Free cans. Men's Health said of the Black Bean & Quinoa Chili, "Quinoa raises the protein content;" and of Eden Garbanzo Beans, "Add these fiber-packed, nutty beans to pasta sauce, or toss them into a Greek salad." Speaking to the process of coming up with their best foods for men list, Men's Health wrote, "We tasted, tested, and analyzed aisles of foods to find the best items in the supermarket right now - the ones that can help you build muscle, lose weight, and live longer." Eden Refried Pinto Beans and Garbanzo Beans are U.S.A. family farm organically grown, fiber rich, and a good source of protein, iron, and magnesium. Eden Refried Pinto Beans contain no added fat. They have half the sodium of other brands with zero chemical additives. Eden Garbanzo Beans are low fat and low sodium with no salt added. Eden Black Bean & Quinoa Chili is organic Michigan black turtle beans, high altitude Andes mountain organically grown whole grain quinoa, with maitake and shiitake mushrooms thoroughly cooked in a savory, 100% organic, chili spiced tomato sauce. Eden Black Bean & Quinoa Chili is ready right out of the pantry, just heat, stir, and serve. Eden Foods is a 44 year, independent, principled natural food manufacturer offering more than 300 authentic, organic, traditional, pure foods. All are superb pantry fare. Information and over 1,100 free recipes are at www.edenfoods.com. We ask retailers, institutions, and co-ops to please visit us at access.edenfoods.com.